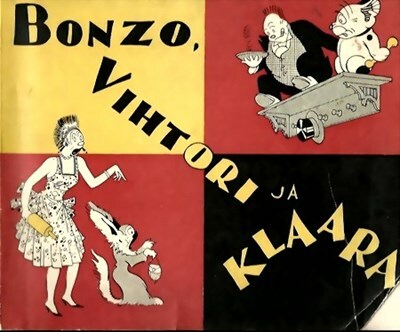 Although perhaps not one of Tulio's best films --- and made on a rather modest budget --- Vihtori ja Klaara is nonetheless a very amusing take on cartoonist George McManus's comic creation. The plot, such as it is, revolves around Vihtori's clandestine involvement with an attractive and rather worldly young woman named Ritva, who is planning to marry boxing champion and garage owner Klasu Tullari, the son of Vihtori's friend Tomi. It also involves daughter Vappu and her fiancé, Peter von Schaslick, a mechanic in Klasu's garage, under the nose of the threatening and suspicious Klaara, with lazy son Nisse acting as a rather sardonic Greek chorus. The film makes hilarious use of a number of situations and set-ups taken directly from McManus's comic strips, opening with the sound of crashing crockery as Klaara attempts to coerce a reluctant Vihtori into accompanying her to the opera. Vihtori's carousing and late nights out with the boys; Klaara's penchant for wielding an over-sized rolling pin; Vihtori's hair-raising descent down knotted bed sheets from an upper-story apartment; Klaara's piano playing and atrocious singing; and Vihtori's humiliation by the neighborhood kids while walking Klaara's miniscule dog, Pipi, are all faithfully recreated from gags first portrayed in McManus's strip.